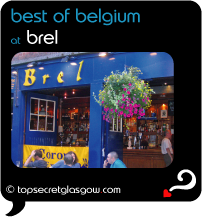 Brel serves up the best Belgian food in cosy, cobbled Ashton Lane by . With too many options of bottled and draught beer to shake a stick at, locals come back for more again and again. Enjoy the Moules Frites or the grilled pork sausages with Belgian mash and onion jus, and finish your meal off with a Belgian chocolate mousse. And another beer! The old coach house doors are flung open in summer offering a peek at the warm wooden space. Hidden away out back, their large beer garden tempts in students, and those who used to be students, as well as all sorts of local charmers. Great news! Finding this page means you can now join our VIP list for Brel. Grab your very own web page all about Brel. Do you have a special story about Brel? A funny experience? A grand occasion? A funky photo? A personal tip? A top secret?